In addition to producing professional, regulation compliant U.S. and Canadian Nutrition Facts graphics, we also carry out Package Review on package designs intended for the Canadian market. Package Review is a process which results in written reports that address the aspects of package design that must be amended to be compliant with Canadian regulations, and guidelines. 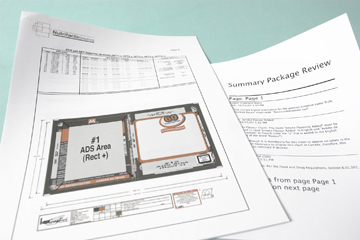 The Review document details the aspects of the package that were checked, and for each, explains non-compliant issues. The Review includes citations referencing the Canadian Food & Drug Regulations, and the Canadian Packaging and Labelling Regulations. The Design Changes Summary shows these non-compliant issues in a form easily understood by a graphic design professional. The NFT provided is typeset according to Canadian Food and Drug Regulations. The NFT PDF created is selected from among the permitted formats shown in the Available Display Surface (ADS) Report provided. The Barcode Review notes aspects of the barcode that should be corrected.